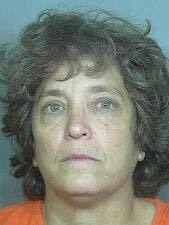 Weld County CO (Oct 22)--Colorado Felony Offender 278185 Deborah Ellen Frisch has been extradited to Weld County. She's been scheduled for a court appearance tomorrow at 1:30pm on her felony arrest warrant. Since her arrest on 5 September in San Diego, Miss Debbie tried to resist extradition to Colorado. Her delaying tactics finally ran dry late last week. She does not look like she is enjoying jail. And yet, when she gets out she *immediately* returns to the antics that put her behind bars. I have to agree with TOC, it is likely Deb has organic brain damage now and should be institutionalized for her own protection.